(Front Side): Levi Coffin (1798-1877), a Quaker abolitionist, lived in Newport (now Fountain City) with his family 1826-1847. Moved from North Carolina because he and his wife, Catharine, opposed slavery. Advocated, and sold in his store, free-labor products not produced by slaves. 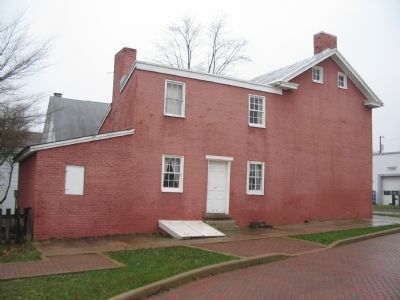 House built circa 1839; designated a National Historic Landmark 1966. (Back Side): Coffin's Reminiscences (1876) documented work in Underground Railroad and antislavery movement. 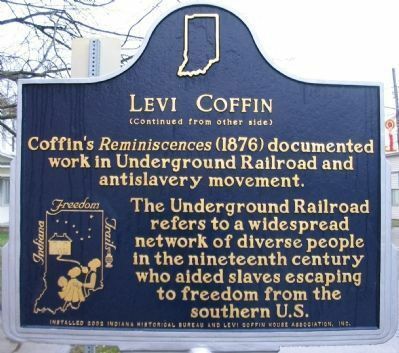 The Underground Railroad refers to a widespread network of diverse people in the nineteenth century who aided slaves escaping to freedom from the southern U.S.
Marker series. This marker is included in the Indiana State Historical Bureau Markers, and the National Historic Landmarks marker series. Street (U.S. 27) and South Water Street, on the right when traveling north on Cross Street. Touch for map. 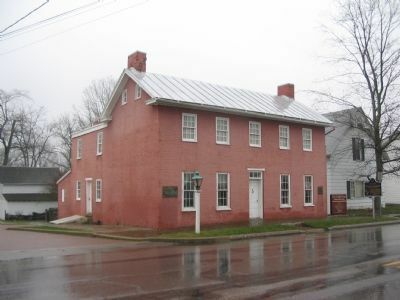 Marker is at or near this postal address: 113 Cross Street, Fountain City IN 47341, United States of America. Touch for directions. Other nearby markers. At least 8 other markers are within 9 miles of this marker, measured as the crow flies. 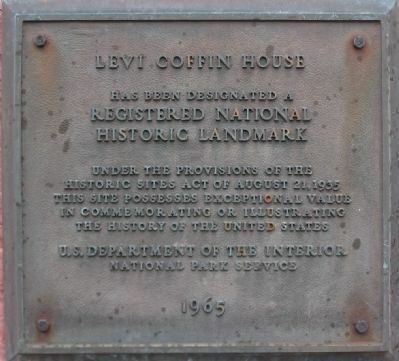 Home of Levi Coffin (here, next to this marker); Fountain City Veterans Memorial (approx. 0.4 miles away); Site of Fort Nesbit (Nisbet) (was approx. 7.4 miles away in Ohio but has been reported missing. ); Richmond's Record Roots (approx. 8½ miles away); Richmond Police Department Memorial (approx. 8.8 miles away); Korean War Memorial (approx. 8.8 miles away); Wayne Township World War II Memorial (approx. 8.9 miles away); Freedom Fountain (approx. 8.9 miles away). Touch for a list and map of all markers in Fountain City. The marker stands in front of the house, on the right. More. 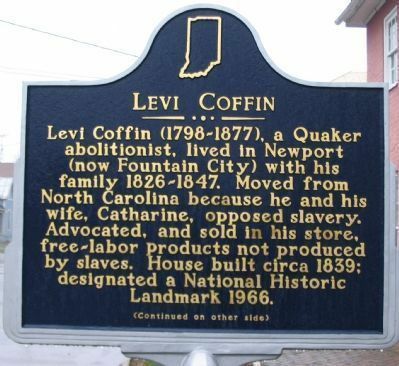 Search the internet for Levi Coffin. Credits. This page was last revised on June 16, 2016. This page originally submitted on January 3, 2008, by Craig Swain of Leesburg, Virginia. This page has been viewed 2,526 times since then and 17 times this year. Photos: 1, 2, 3, 4, 5. submitted on January 3, 2008, by Craig Swain of Leesburg, Virginia.